Monarch Air Group provides private air charter in Hong Kong. Our clients benefit from top-notch service, unrelenting dedication to safety, wide selection of aircraft, and years of experience in chartering private jets. To obtain a free quote, please use our online quoting tool provided below, or call toll free 1-877-281-3051. Monarch Air Group provides private jet charter flights in and out of Hong Kong, China. Hong Kong is a special administrative region on the south-east coast of China. It has an area of 425 square miles and a population of over 7 million people, and it’s one of the most populated areas in the world. 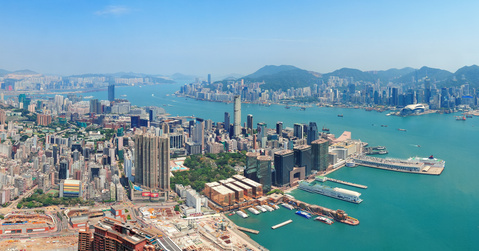 Hong Kong is made up of the Kowloon Peninsula, Hong Kong Island, the New Territories, and over 200 Outlying Islands. With the 3rd busiest container port in the world, it is a significant commercial, financial, shipping and manufacturing center of the country. The economy of Hong Kong is mainly based on electronics, manufacturing, machinery, textiles, plastics, apparel, precious stones, footwear, toys, and watches. In addition, it is home to the Hong Kong Stock Exchange, the 3rd largest stock exchange in Asia and the 6th largest in the world. Often called the “Pearl of the Orient” and “Asia’s World City”, Hong Kong is a vibrant and diverse city in its various traditions, cultures and exotic influences attracting tourists from all over the world. The most notable tourist attractions are Hong Kong Coliseum, Peak, Hong Kong Heritage Museum, Hong Kong Space Museum, Hong Kong Museum of Art, Ocean Park, Victoria Harbor, Repulse Bay, Po Lin Monastery and the Giant Buddha, Temple Street Night Market, Tai O Fishing Village, Lantau Island and much more. With beautiful natural scenery, mild climate, rich history and culture, and unique traditions, Hong Kong is one of the most popular travel destinations in the world. Hong Kong is serviced by Shenzhen Bao’an International Airport (SZX), Macau International Airport (MFM) and Hong Kong International Airport (HKG). 1. HHP, H K Heliport, Hong Kong, Hong Kong. 2. HKG, Hong Kong International, Hong Kong, Hong Kong. 3. HUZ, Huizhou, Huizhou, China. 4. KTZ, Kwun Tong, Kwun Tong, Hong Kong. 5. MFM, Macau International, Macau, Macau. 6. QDM, Shek Mum, Shek Mum, Hong Kong. 7. SZO, Shanzhou, Shanzhou, China. 8. SZX, Shenzhen, Shenzhen, China. 9. ZAS, Shunde Ferry, Shunde, China. 10. ZCU, She Kou Ferry, She Kou, China. 11. ZGN, Zhongshan Ferry Port, Zhongshan, China. 12. ZJK, Off Line Point, Chek Lap Kok, Hong Kong. 13. ZTI, Humen Port, Humen, China. 14. ZUH, Zhuhai Airport, Zhuhai, China. 1. Dorsett Far East Hotel, Hong Kong New Territories, 荃灣青山公路荃灣段135號. 2. L’hotel Nina Et Convention Centre, 8 Yeung Uk Road, Hong Kong. 3. Dorsett Far East Hotel, Hong Kong New Territories, 荃灣青山公路荃灣段135號. 4. Royal View Hotel, 353 Castle Peak Road (ting Kau), Ting Kau. 5. Panda Hotel, 3 Tsuen Wah Street, Hong Kong. 6. L’hotel Nina Et Convention Centre, 8 Yeung Uk Road, Hong Kong. 7. Silka Far East Hotel – Hong Kong, 135 Castle Peak Road (tsuen Wan), Tsuen Wan. 8. Dorsett Far East Hotel, Hong Kong New Territories, 荃灣青山公路荃灣段135號. 9. Royal View Hotel, 353 Castle Peak Road (ting Kau), Ting Kau. 10. L’hotel Nina Et Convention Centre, 8 Yeung Uk Road, Hong Kong.